John McDowell amply illustrates a major problem of modern philosophy--the insidious persistence of dualism--in his discussion of empirical thought. Much as we would like to conceive empirical thought as rationally grounded in experience, pitfalls await anyone who tries to articulate this position, and McDowell exposes these traps by exploiting the work of contemporary philosophers from Wilfrid Sellars to Donald Davidson. These difficulties, he contends, reflect an understandable--but surmountable--failure to see how we might integrate what Sellars calls the logical space of reasons" into the natural world. 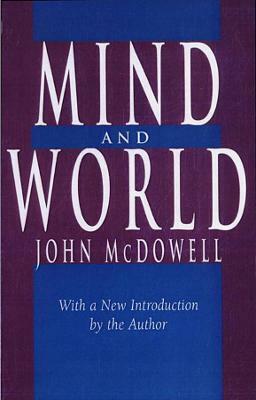 What underlies this impasse is a conception of nature that has certain attractions for the modern age, a conception that McDowell proposes to put aside, thus circumventing these philosophical difficulties. By returning to a pre-modern conception of nature but retaining the intellectual advance of modernity that has mistakenly been viewed as dislodging it, he makes room for a fully satisfying conception of experience as a rational openness to independent reality. This approach also overcomes other obstacles that impede a generally satisfying understanding of how we are placed in the world. Modern philosophy finds it difficult to give a satisfactory picture of the place of minds in the world. In Mind and World, based on the 1991 John Locke Lectures, one of the most distinguished philosophers writing today offers his diagnosis of this difficulty and points to a cure. In doing so, he delivers the most complete and ambitious statement to date of his own views, a statement that no one concerned with the future of philosophy can afford to ignore. John McDowell amply illustrates a major problem of modern philosophy - the insidious persistence of dualism - in his discussion of empirical thought. Much as we would like to conceive empirical thought as rationally grounded in experience, pitfalls await anyone who tries to articulate this position, and McDowell exposes these, traps by exploiting the work of contemporary philosophers from Wilfrid Sellars to Donald Davidson. These difficulties, he contends, reflect an understandable - but surmountable - failure to see how we might integrate what Sellars calls "the logical space of reasons" into the natural world. What underlies this impasse is a conception of nature that has certain attractions for the modern age, a conception that McDowell proposes to put aside, thus circumventing these philosophical difficulties. By returning to a pre-modern conception of nature but retaining the intellectual advance of modernity that has mistakenly been viewed as dislodging it, he makes room for a fully satisfying conception of experience as a rational openness to independent reality. This approach also overcomes other obstacles that impede a generally satisfying understanding of how we are placed in the world.